Discussion in 'Guides' started by BoPeach, Apr 8, 2019. 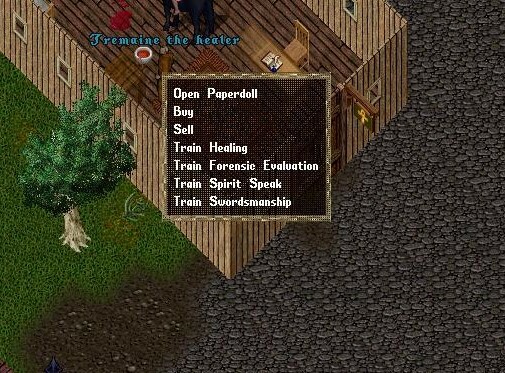 Begin by always buying up your skill as high as possible.The Brit Healer is the building west, right next to the Brit Inn where you begin (as a new player). Training your healing typically will cost between 400-500gp depending. Once you have bought up your skill as high as possible from the NPCs you can begin macroing. This macro requires a "Magical Wizard's Hat" which you can purchase from a mage shop NPC. What this macro does is put the hat on and then takes it off which changes your character's strength by 5, making your hit points fluctuate and creating an opportunity for you to heal yourself. You may find you start to get stuck around 88.2/88.3 skill using the magical wizard hat macro. At this point switch over to healing a ghost. Use an alt account/character to sit dead for you as you attempt to heal them. This will get you from 88 to GM quickly. The easiest option from 88-GM is to record your own macro as the variables will differ. Double click your bandaid stack. Then add a pause '10000' at the very end of the macro. Training your healing you will need approximately 1500 clean bandages to get to GM. halygon and Gmonk like this. Good stuff. I did not know about the hat trick. I did mine on a ghost straight away to save time. I did anatomy at the same time on a random frog since it was a tad slower. Tarek Bin Ziad likes this. lol you called it a hat trick.